Even with cranes, helicopters, tractors and trucks at our disposal, it would be tough to construct the Great Pyramid of Giza today. Its construction 4,500 years ago is so astounding in some people’s eyes that they invoke mystical or even alien involvement. But the current theory of the building of the Great Pyramid — the notion that it was assembled from the inside out, via a spiraling internal ramp — is probably still the best construction plan. Following that plan, we could replicate the Wonder of the Ancient World for a cool $5 billion. First, let’s look at the blueprint: The pyramid is 756 feet long on each side, 481 feet high, and composed of 2.3 million stones weighing nearly 3 tons each for a total mass of 6.5 million tons. Legend has it that the structure was erected in just 20 years’ time, meaning that a block had to have been moved into place about every 5 minutes of each day and night. That pace would have required the (slave) labor of thousands. 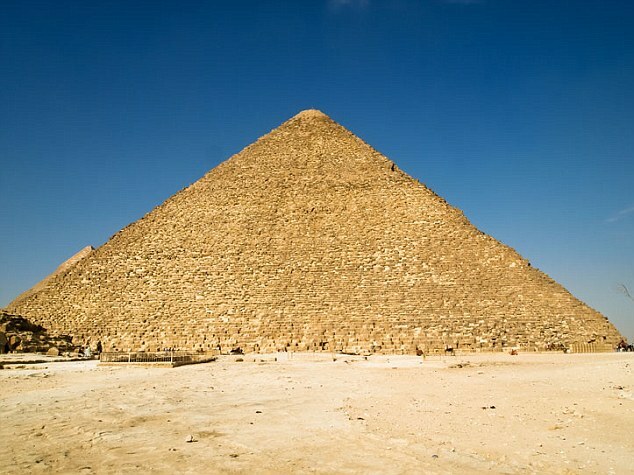 While traditional theories hold that the pyramid was built via a long external ramp, such a ramp would have had to wind around for more than a mile to be shallow enough to drag stones up, and it would have had a stone volume twice that of the pyramid itself. The secret gates at the heart of the Great Pyramid may be opened for the first time in 2012, a British robot company believes – solving a mystery that has puzzled archaeologists since 1872. Scoutek UK had already begun exploring behind the gates earlier this year – and produced the first-ever images from behind the gates using a ‘micro snake’ robot. But the exploration was halted by the recent unrest in Egypt. The words “ancient Egyptian art” brings to mind the popular tomb art found in the region of the Upper Nile, created between 5000 BC and about 300 AD. As ancient as those works are, they’re almost contemporary compared to what a Yale University professor and a team of Belgian scientists found in Qurta, Egypt — rock carvings dating back to between 15,000 and 23,000 years ago. They are the oldest Egyptian works of art known to exist and are among the oldest art found anywhere. The findings were announced in the December issue of Antiquity, a peer-reviewed scientific journal. These carvings are nothing like the familiar Egyptian carvings and paintings of man-beast gods, epic battles and the beauty of Nefertari. Rather, these newly discovered works offer views of animals that the Paleolithic hunters encountered — mostly the wild predecessors of the domestic cattle of today. Other carvings, called petroglyphs, depict hippos and gazelles. Humans are found, too, among the drawings, but usually they are shown only as stick figures. The researchers said that the carvings have more in common with the drawings found in Lascaux, the cave in France, as opposed to the art of the Egyptian dynasties. The Lascaux cave paintings have been dated to 17,300 years ago, or about the same era as this new discovery in Egypt.